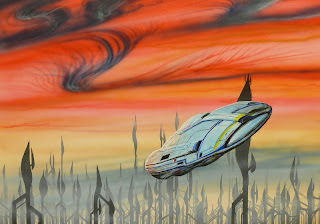 Uploaded a few "new" paintings to the SF Artwork section on my website. Actually this one is new; I started it last monday and finished it four nights later. I'm on the Coode Street Podcast, with Jonathan Strahan and Gary K Wolfe. We recorded it in Reno back in August. It had been a long day - I'd flown in from LA, via Oakland, and then had a rush to check in to my hotel and then get over to the convention centre in time for a meet-up with the Locus crew. After a few beers with Ian Mcdonald and various parties, I then headed for a wonderful but eyewateringly expensive steak, and then Jonathan, Gary and I repaired to a hotel room to record the podcast. I don't think I was firing on all cylinders by that point, but playing it back, and allowing for the odd thoughtful pause, I don't sound quite as slow-witted as I remember feeling, so maybe all was well after all. As always, Jonathan and Gary were terrific company - I could spend all day talking about SF with these guys - and indeed we did continue the discussion, down in the casino bar. For those not following my twitter feed, I'm going to be taking part in Dr Karl's live science phone-in, tonight, on BBC Radio 5's Up all Night with Rhod Sharp. Our segment is supposed to go out between 2.30 and 3.30 AM although it might shift a bit depending on the running schedule. The program will be available on iplayer for those in the UK. It’s a terrible and beautiful thing I’ve done. I suppose I already had it in mind, when the last uplink came in. Not that I’d come close to voicing the possibility to myself. If I’d been honest about the course I was on, I might well have requested immediate committal to stasis. The right thing to do, in hindsight. And maybe we’d be on our way home now, back to the gratitude of a thousand worlds. Our house would have crumbled into the sea by the time we got back. But we could always have built a new one, a little further from the headland. Let me tell you something about myself, while there’s still time. These words are being recorded. Even as I speak, my suit’s mouse-sized repair robot is engraving them onto the suit’s exterior armour. Isolated in this cavern, the suit should be buffered against the worst excesses of cosmic ray and micro-particle damage. Whether the inscriptions will remain legible, however, or whether in some sense you’ve already read them, I won’t begin to speculate. There’s been enough of that already, and I’m a little burned out by it all. Deep futurity, billions of years – the ultimate futility of any action, any deed, enduring for the smallest fraction of eternity – it’s enough to shrivel the soul. Vashka could handle that kind of thing, but I’m made of less sterner stuff. 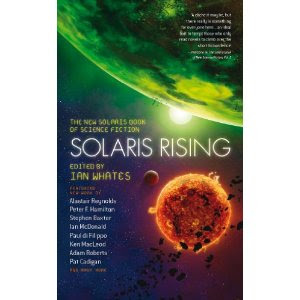 Imminent, on both sides of the Atlantic, is Solaris Rising, the new all-original SF anthology edited by Ian Whates. It includes my 7000 word story "For the Ages", about diamond planets, pulsars and the ultimate knowledge limits of cosmology. Word frequency cloud for a large chunk of BLUE REMEMBERED EARTH, via tagcrowd.com. 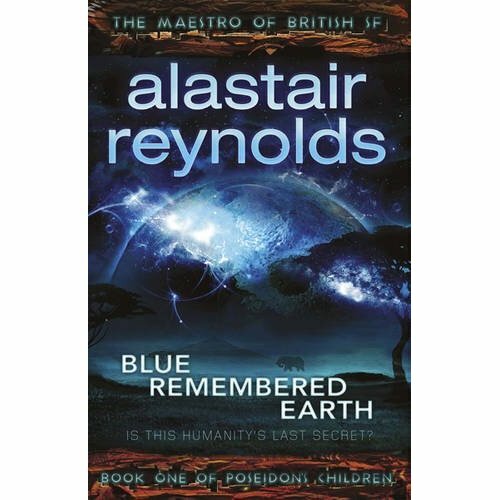 I'm delighted with it; I think it does a fabulous job of not only capturing the main themes of Blue Remembered Earth, but also of hinting at the elements (should that be elephants?) that will come to play an increasingly significant role in the successive books. And the colours are gorgeous. I've seen a door-sized blow-up of this cover and it's a thing of real beauty. As for the next book, I'm well into it. It's a skewed take on very slow interstellar travel, picking up the threads of BRE a few centuries down the line. The main character, like Geoffrey and Sunday in BRE, is an Akinya - but it's a bit less straightforward than that. It's also about humans and machines, longevity, memory and identity, alien intelligence, exoplanets, and elephants. I'm Alastair Reynolds, a science fiction writer based in Wales. I used to work for the European Space Agency, before turning to full-time writing. I have written fifteen novels and well over sixty short stories. I have been nominated for some awards and won one or two. I used to be on Twitter but now I'm not. This is my working blog; you can also find a bit more about me and my writing by going to my author website at www.alastairreynolds.com You can call me Al.